To identify the possible seismic retrofitting requirements in your specific area, Core Contractors assembled important information for Wood Frame Seismic Retrofit Programs for Soft-Story structures in your specific area. For the most up to date information, please contact the municipality pages using the links provided or contact us should you need additional information. The program oversight has been assigned to the Los Angeles Department of Building and Safety (LADBS). The timeline for compliance is based on an order/notification from LADBS. The triggers for the program are based on the notification letter sent to the owners of each Soft-Story property. Phases of the Soft-Story Seismic Retrofit Program are outlined below. Additional information about the City of Los Angeles Mandatory Soft-Story Seismic Retrofit Compliance Program can be obtained from the LADBS here. 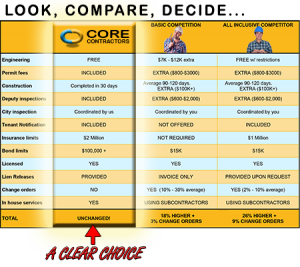 Core Contractors has designed and developed exactly the program to meet the outlined criteria. Contract us here to have one of our engineers provide you with a no obligation free evaluation and if necessary an estimate to retrofit your structure.